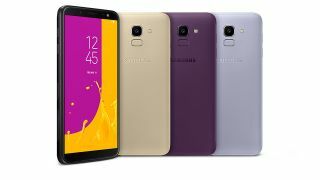 Samsung has announced the latest in its budget smartphone offerings with the new Galaxy J6. The new handset will bring some of Samsung's higher-end design and features, like the Galaxy S9's AR Emoji to the budget market. Front and center for the new Galaxy J6 is a 5.6-inch screen that covers a good percentage of the phone's front. With this style of reduced-bezel display showing up in more and more premium phones, availability in more affordable phones will likely be welcomed by customers. Said screen also uses a Super AMOLED panel for excellent contrast ratios. The resolution is a lower 720 x 1,480, but on a screen of its size, that still produces an adequately crisp pixel density. Inside the Galaxy J6, an octa-core processor clocked at 1.6GHz runs Android 8.0 Oreo on 3GB of RAM and 32GB of storage, and will be powered by a 3,000mAh battery. Samsung hasn't clarified just what model processor will be used, and that may be due to regional variations. Storage is expandable up to 256GB with a microSD card. The Galaxy J6 will include a 13MP rear camera and an 8MP front-facing camera, both of which will feature an LED flash. Samsung's AR Emoji will also be functional on the J6. A fingerprint scanner on the rear will offer easy unlocking. Samsung plans to release the phone in the UK later this year, though the verdict is still out on a global release. This launch comes shortly after Motorola's Moto G6, which is another budget smartphone going big on the display. The two may soon be going head to head for the attention of budget-minded shoppers.